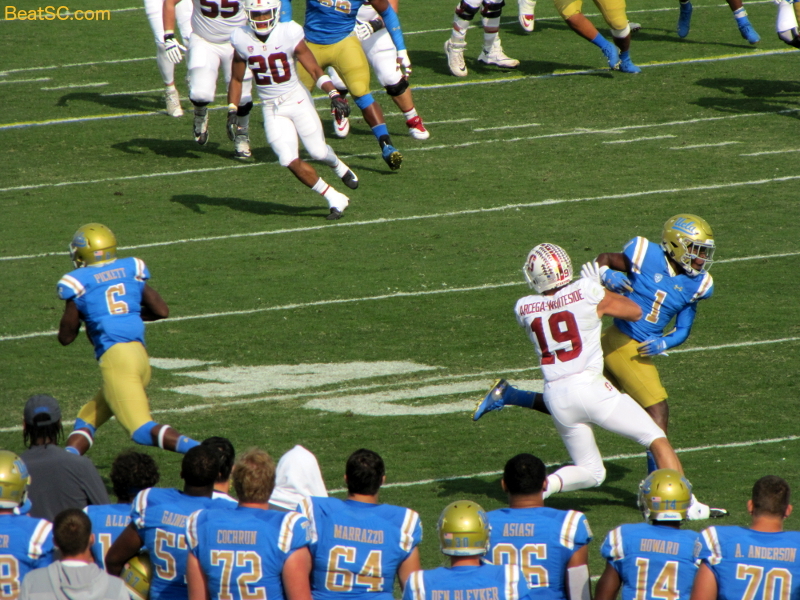 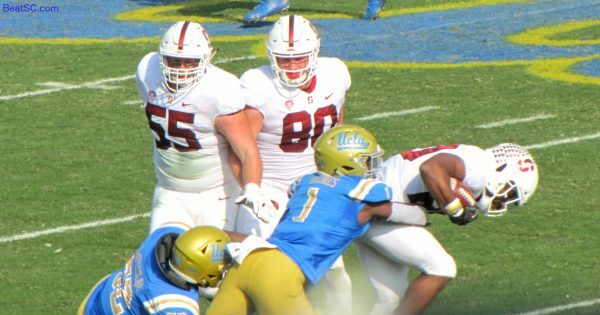 Speight carried the team on his back, as Stanford was able to contain Joshua Kelley, holding him to only 55 yards. Kelley did score 2 TD’s, and his back-up Martell Irby also scored, on a 12-yard run, but it was the Air Attack that propelled the Bruins throughout this shootout. 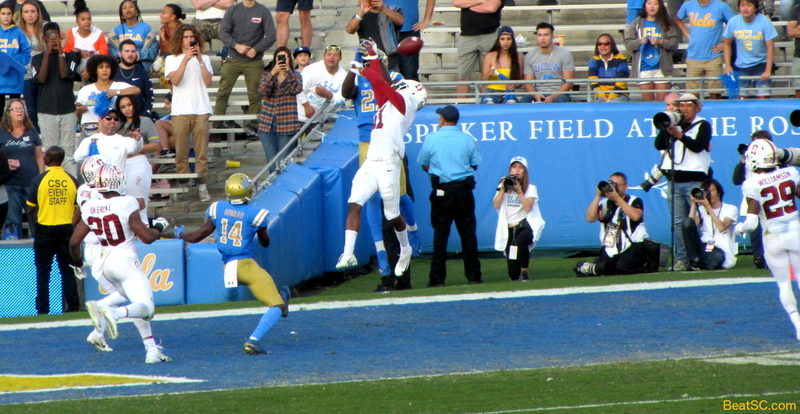 Caleb Wilson was the leading Receiver with 9 receptions for a career-high 184 yards, and Theo Howard added 88 yards on 5 catches. 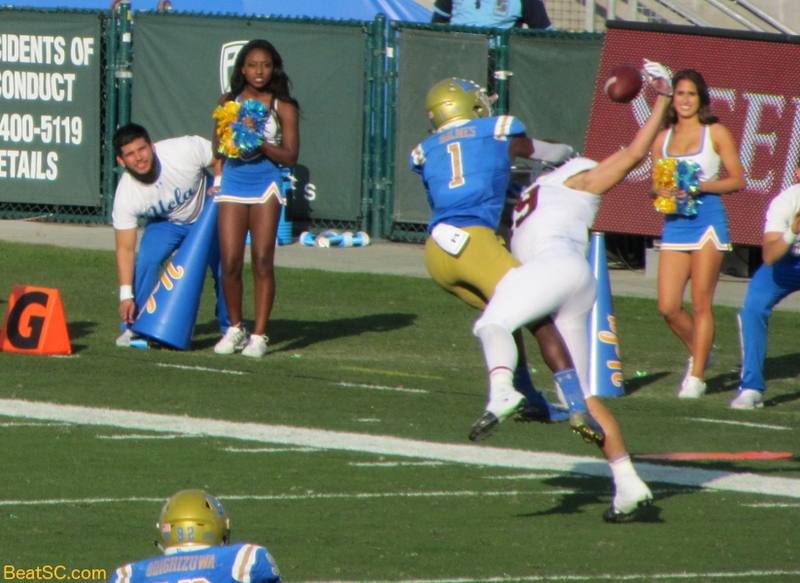 Michael Ezeike, Chase Cota, and Christian Pabico also caught multiple balls. None of them got in the end zone though. 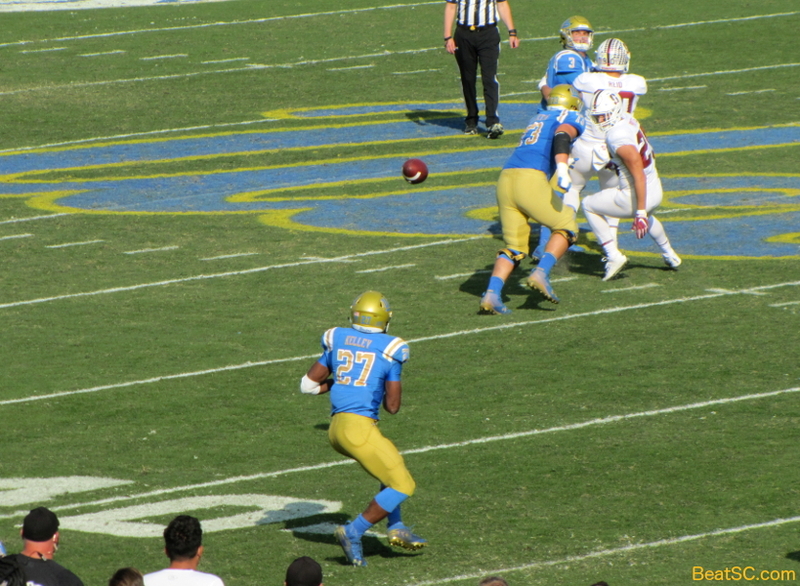 Speight did, on a 1 yard run. 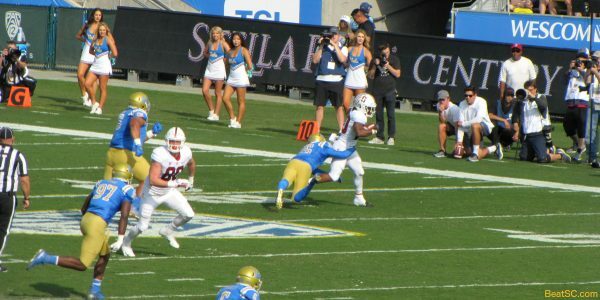 The Bruins also got 2 Field Goals from J.J. Molson, and a Safety, when Martin Andrus stuffed Bryce Love in the end zone. 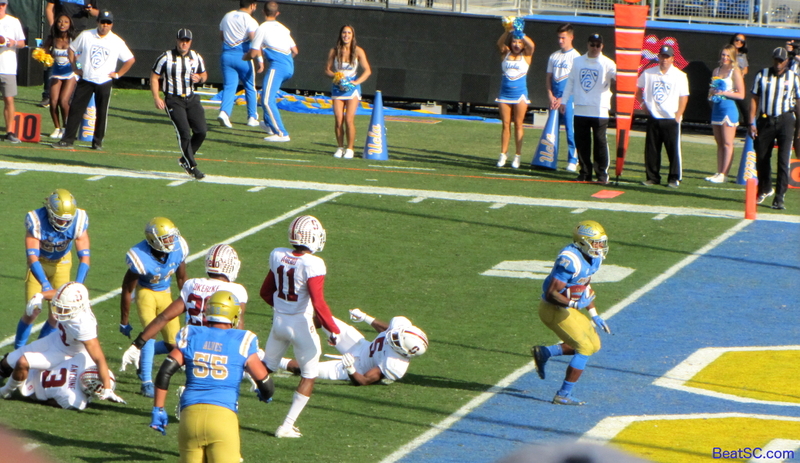 And on the ensuing kick after the safety, Darnay Holmes ran for a 93-yard Return Touchdown. 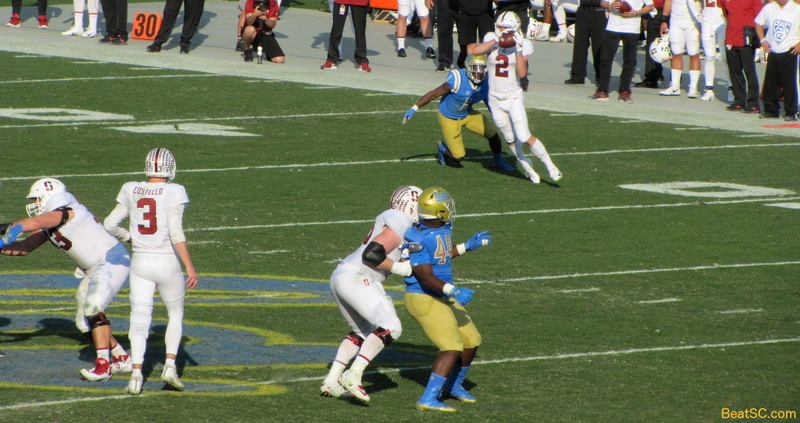 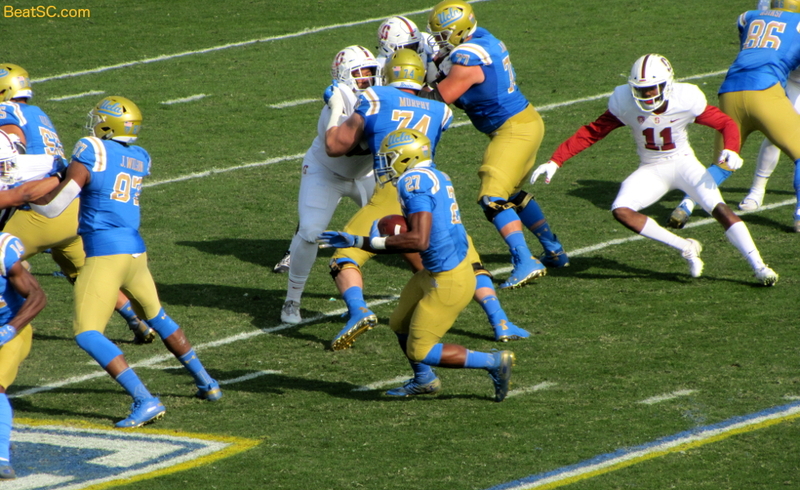 That TD cut the Stanford lead to 41-36, and Irby’s TD in the 4th gave UCLA the lead, 42-41 with about 9 minutes left. 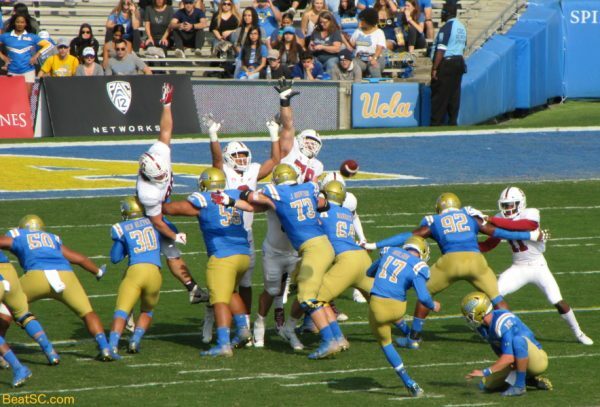 They missed a 2-point try. Stanford retaliated immediately, with a 55-yard TD bomb, and a converted 2-pt. 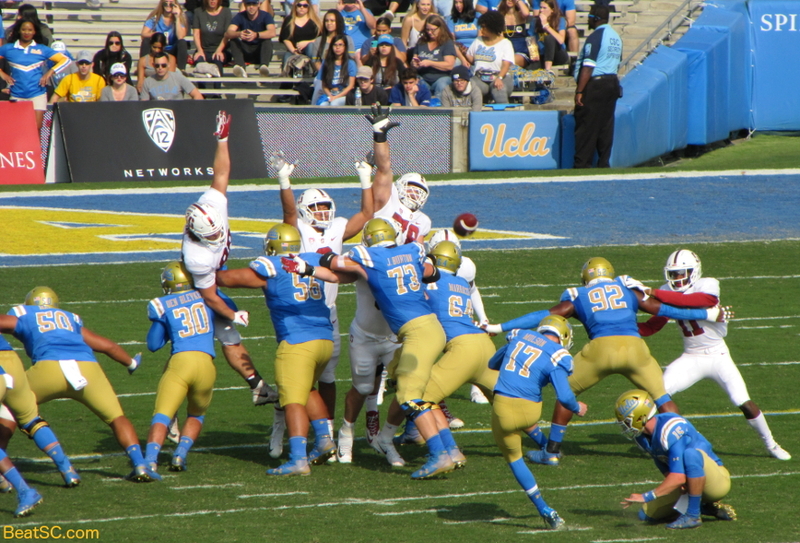 try to make it 49-42. 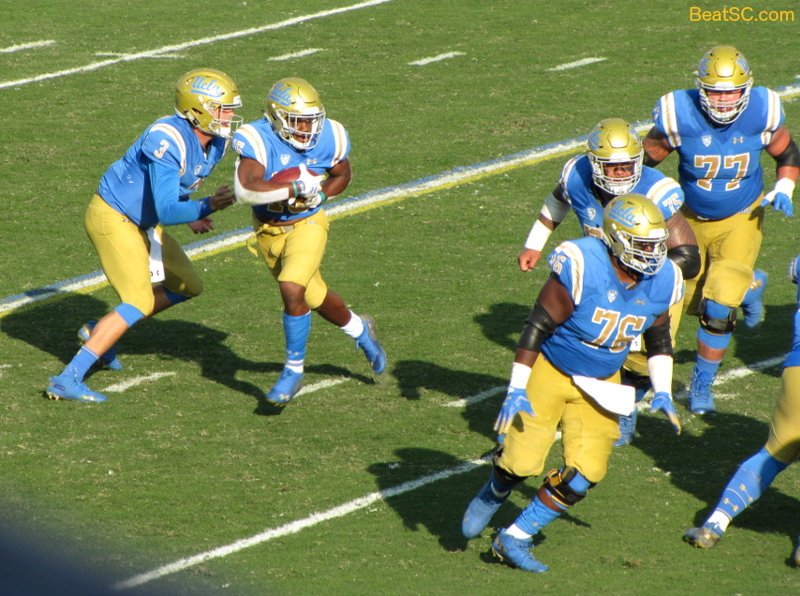 The Bruins still had a chance to tie, but Speight couldn’t avoid the pass rush long enough to find open receivers. While Speight did carry the Bruins for much of the game, he also cost them the game, by holding the ball too long and getting sacked 6 times. 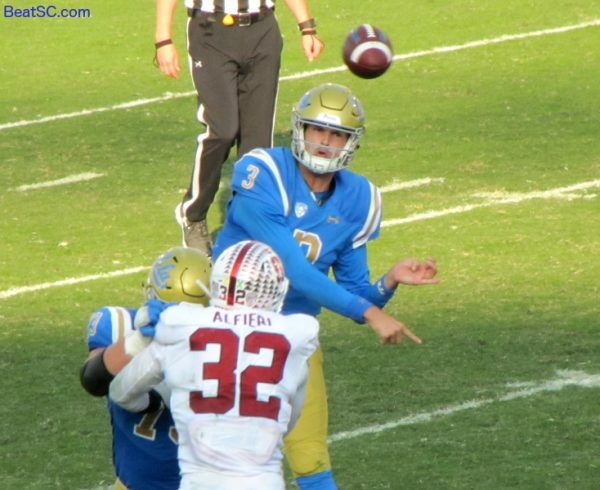 He also threw an Interception and lost an unforced fumble. 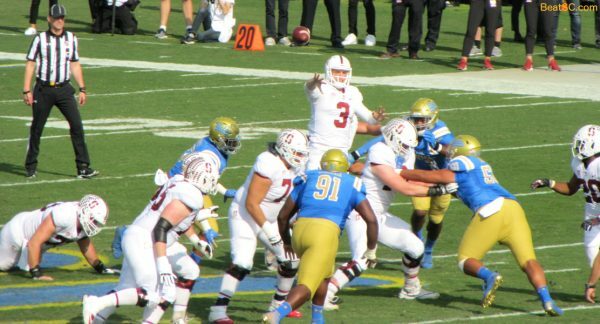 Of course, it’s hard to blame the Quarterback, when the Offense scores 33 points, and the Defense gives up 49. 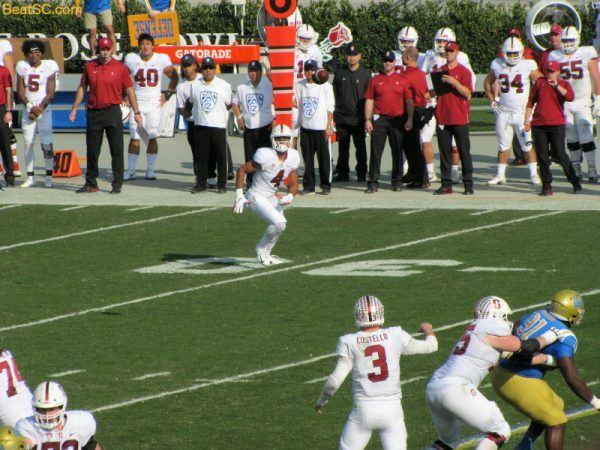 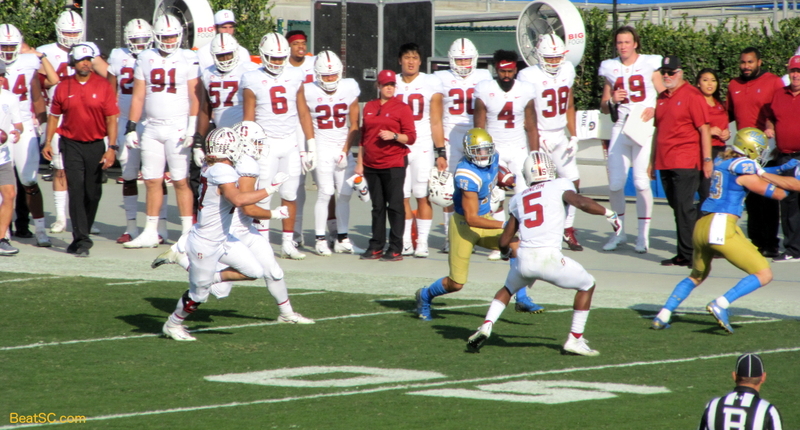 Stanford was able to exploit the Bruins’ Pass Defense for 344 yards and FIVE Passing Touchdowns. 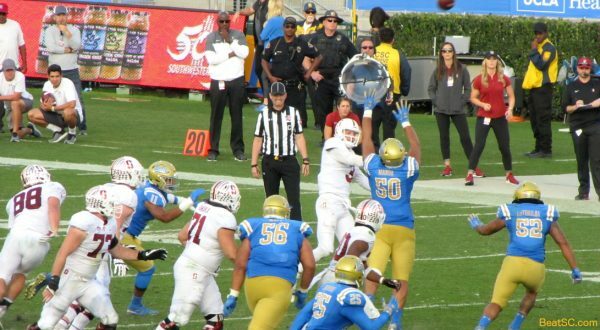 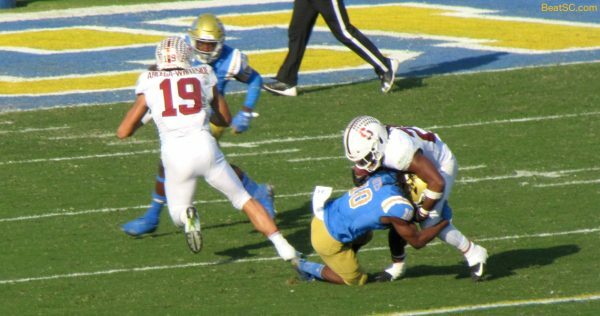 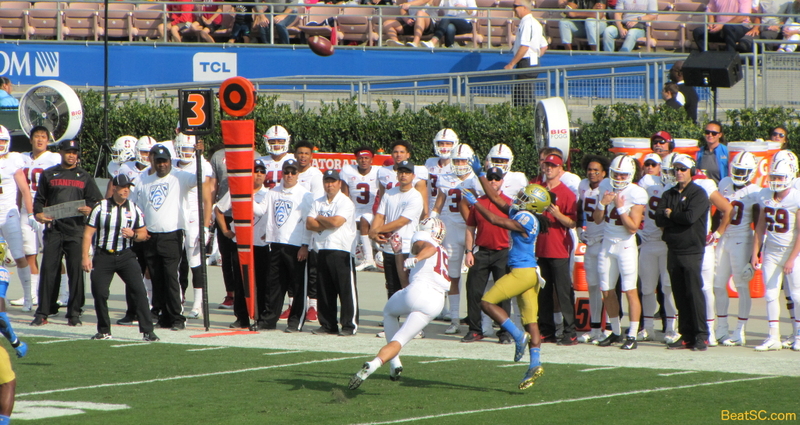 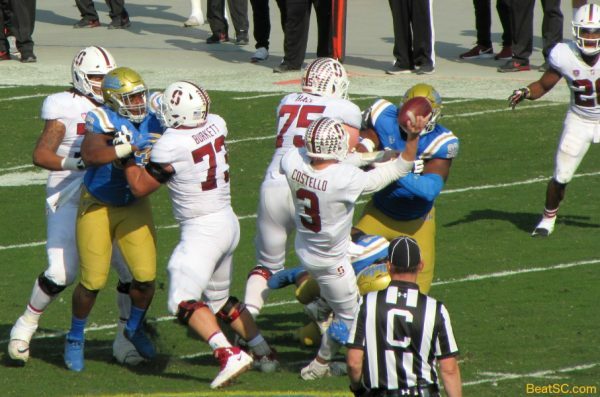 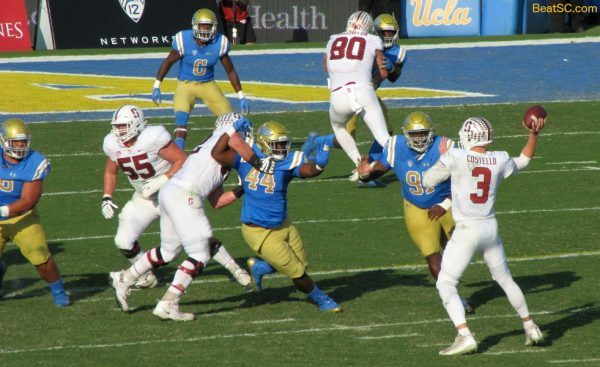 The really sad part was that Stanford’s #19 J.J. Arcega-Whiteside had 11 Receiving TD’s coming in, so UCLA should have been keying on him, or double-teaming him. Instead, they entrusted the job of covering him to Darnay Holmes, and others, I guess, one at a time. 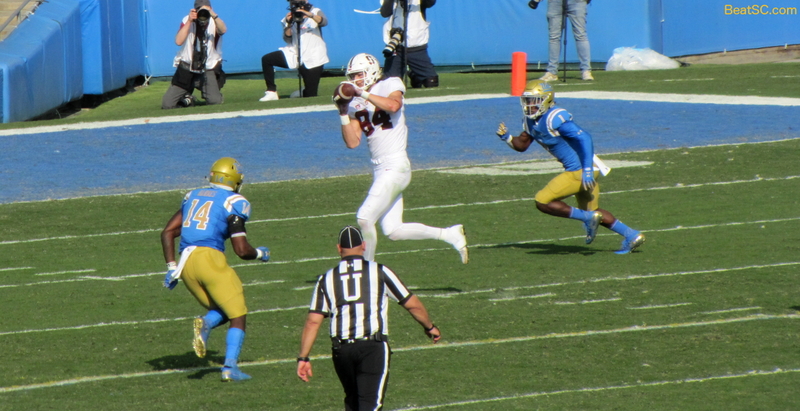 The strategy of not doubling him led to Arcega-Whiteside catching the first TD of the game. The Bruins didn’t adjust, so he caught 2 more. 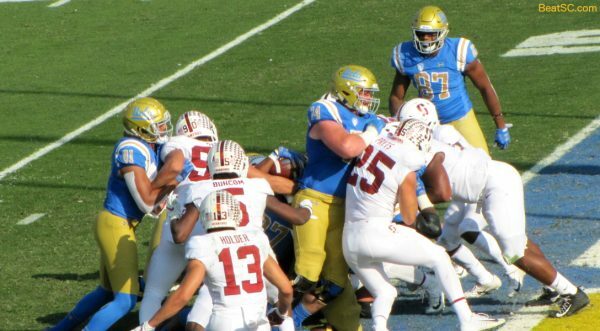 At least he didn’t catch the game-winning 55-yard strike — You gotta make someone else beat you — and that’s what happened. 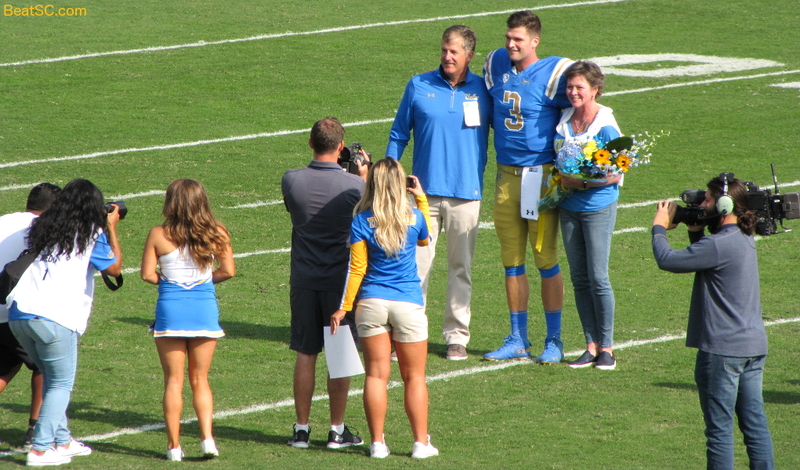 So it was a brutal afternoon, but things got better in the evening. 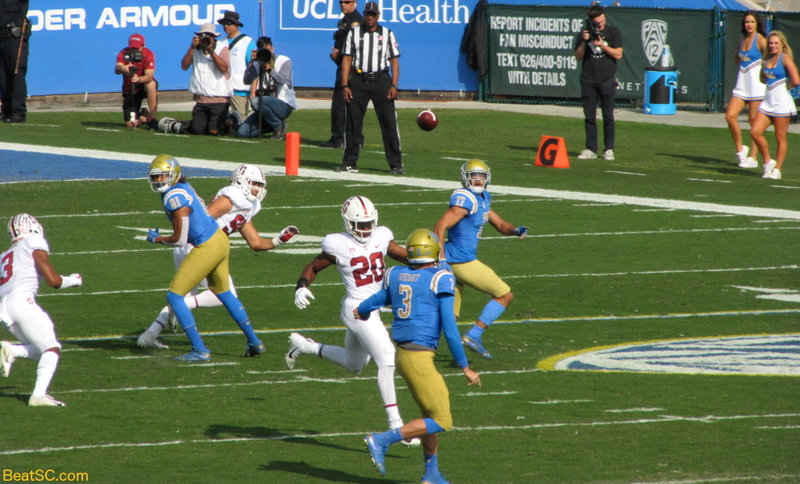 Heavy underdog u$c hosted undefeated #3 Notre Dame, and came out on fire, dominating the first quarter and taking a 10-0 lead. 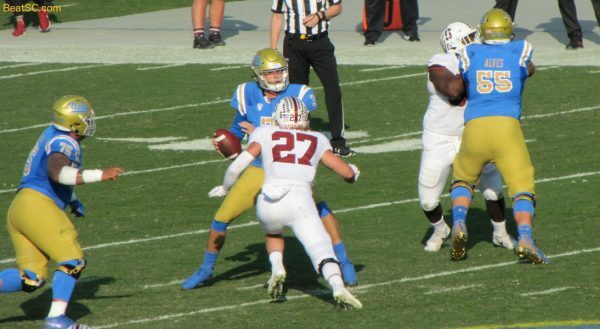 But a general collapse of penalties and turnovers followed, as Notre Dame adjusted while Clay Helton just watched, and the Fighting Irish put up 24 straight points. 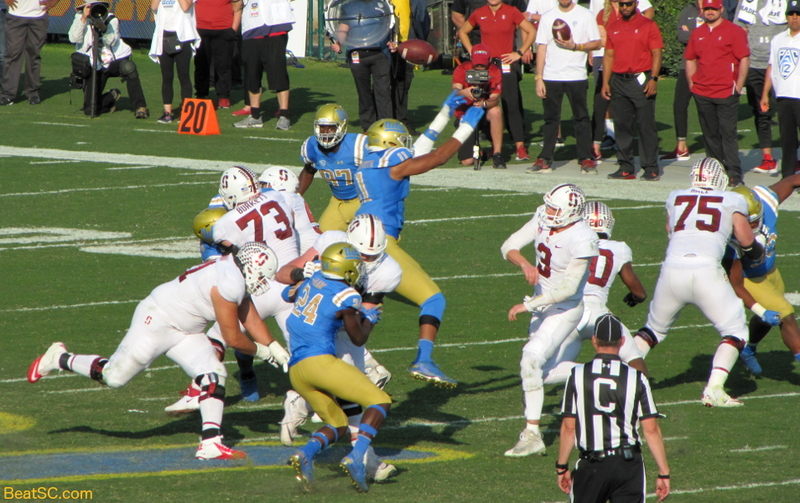 SC scored with a minute to go to cut it to 7, but did not recover the onside kick, so Notre Dame held on 24-17, and will be in the College Football Playoffs for the first time. 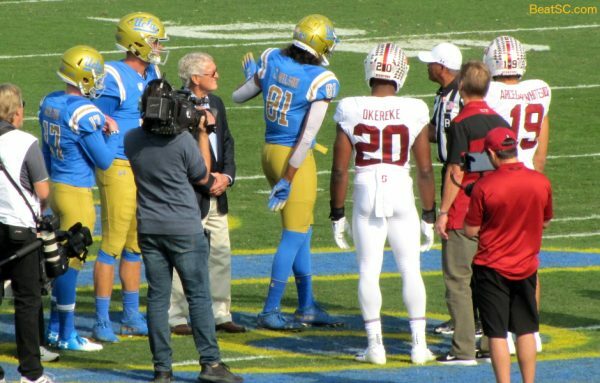 That should be fun for trojans to have to watch their “other” rival play for the Championship. Of course the way ND looked tonight, there is no way they can compete with Alabama, so troy fans probably won’t have to watch the Golden Domers celebrate a National Title. 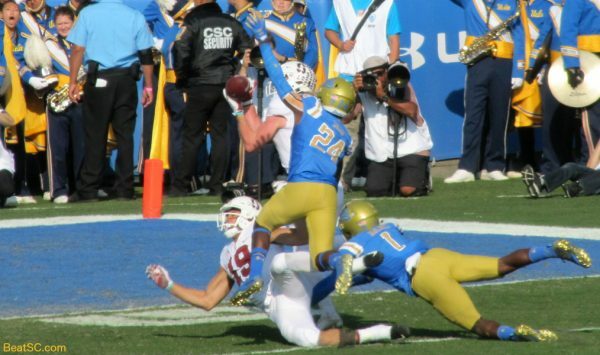 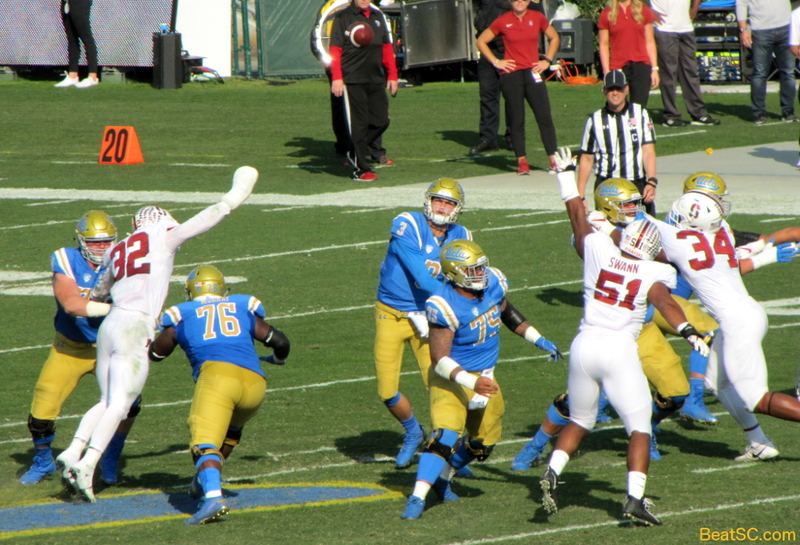 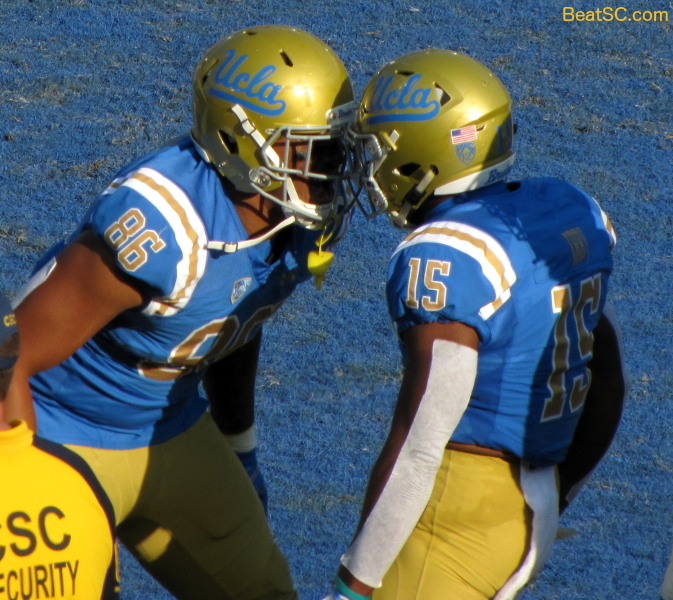 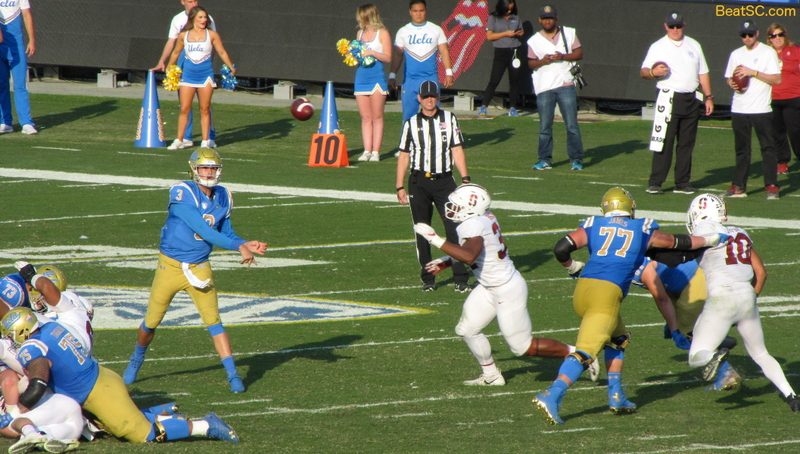 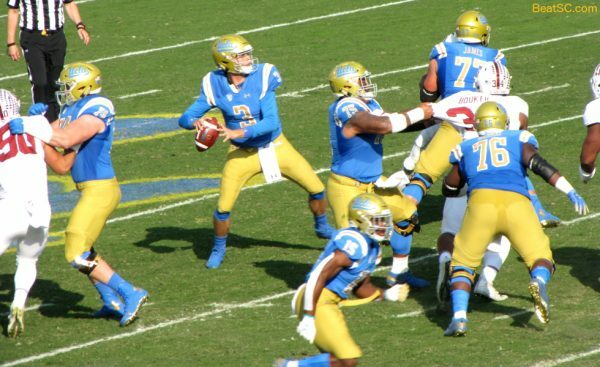 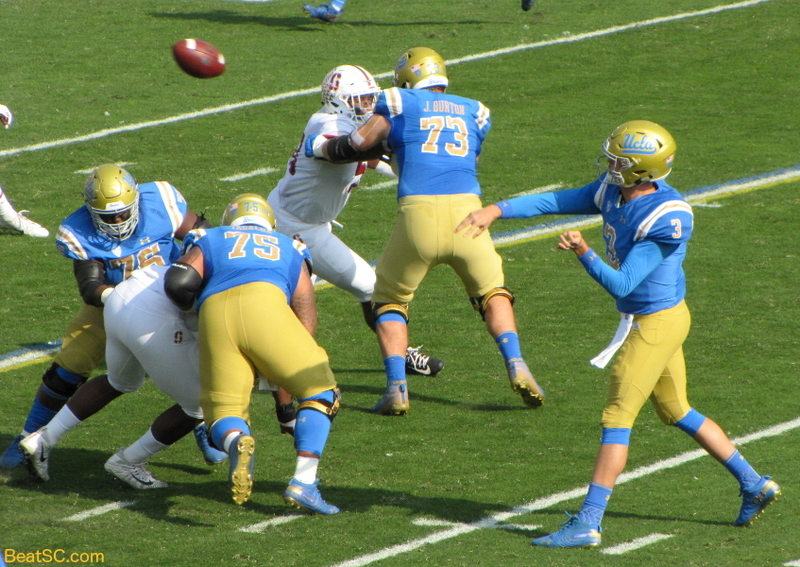 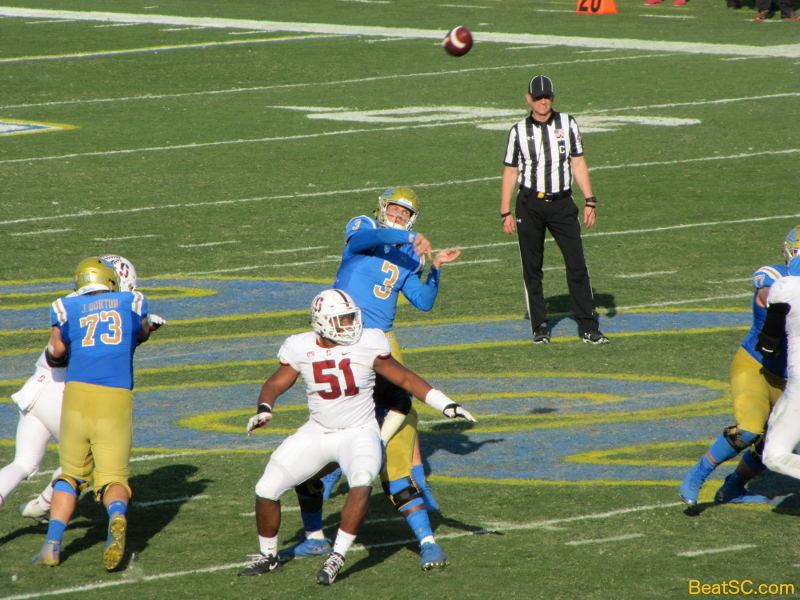 Here are 42 Football pics from the wild UCLA-Stanford game. See the NEXT two articles for photos of the UCLA Spirit Squad. 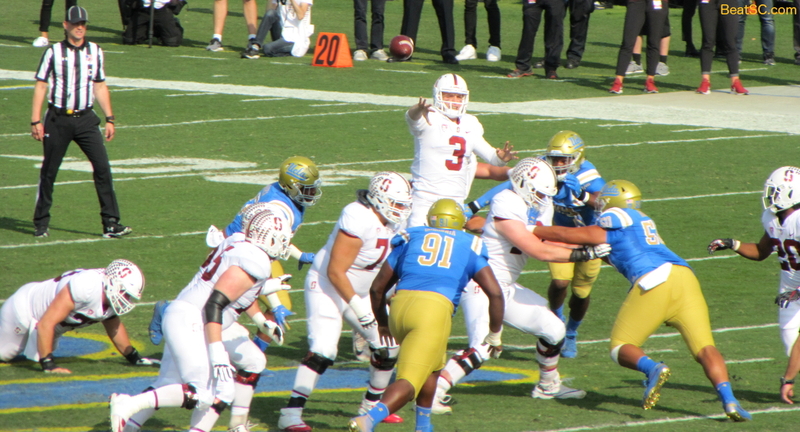 I’m breaking this event into 3 parts so the pics load easier on your iPhones, etc. 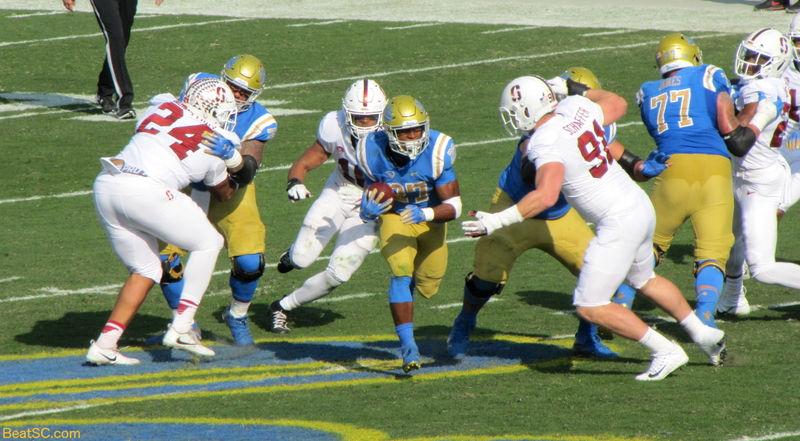 Joshua Kelley scores his first TD. 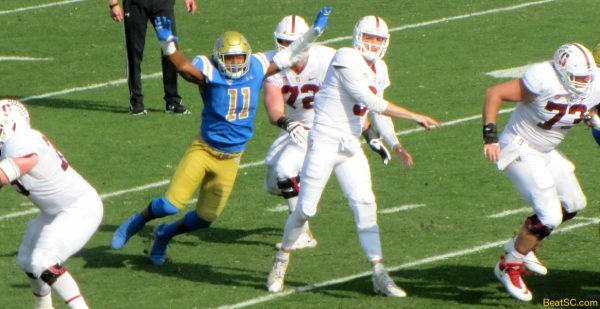 "ELEVENTH SOUR" was published on November 25th, 2018 and is listed in Blue & Gold News, News from the Dark Side, UCLA/usc/Sports Photos.